The Mirage 2000 is a multi-mission, multirole fighter aircraft developed by French company Dassault Aviation. The Dassault Mirage 2000 is a delta wing , single-engine Fourth Generation fighter aircraft and designed to replace the Mirage III already in service with the French Airforce. The Mirage 2000 is in service with the French Airforce since 1984 and the first operational squadron was also formed in the same year on the eve of 50th anniversary of the French Air Force. The Dassault has exported Mirage 2000 to many countries which include India , Taiwan , Abu Dhabi, Greece, Egypt, Qatar and Peru. The total of almost 600 Mirage’s is currently operational worldwide which makes it one of the most successful fighter planes in Dassault clan. The Mirage 2000 was initially conceptualized in 1965 and planned to be designed in collaboration with Britain under joint venture project “Anglo-French Variable Geometry” ( AFVG ) which was designed to be a swing-wing aircraft. After working for two years on this project the French Dassault decided to exit from this project on the grounds of cost and other differences. The Dassault had already done substantial work on delta wing model which is based on variable-geometry aircraft design. On the other hand , Britain decided to join the hands with west Germany and Italy , After the French exit from “Anglo-French Variable Geometry” project and started work on to produce the Panavia Tornado aircraft . Subsequently, Dassault also experimented with twin-engine version of Mirage G8 but this aircraft turned out to be very expensive as compared Mirage F1 and this design was later on cancelled . By 1988 the nnuclear-capable Mirage 2000 N was also operational . This variant was designed to carry the Air-Sol Moyenne Portée (ASMP) nuclear stand-off missile capable. Although Mirage 2000 inherits its legacy from Mirage III but these are two totally different aircraft. Role Multi-role , Multi-mission , All weather day and night missions capability . Designed for both Air Superiority and Ground Attack . The Indian government approved the acquisition of Mirage 2000 for Indian Air Force ( IAF ) in response to the induction of F-16 in Pakistani Air Force provided by the US . 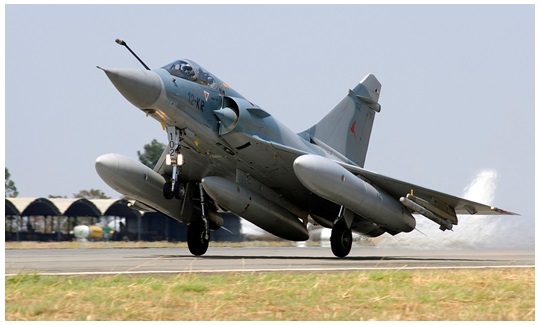 India placed the order with Dassault Aviation in October 1982 for two squadrons of Mirage 2000 Hs which consist of 36 single-seat planes and 4 twin-seat Mirage 2000 THs which is a trainer version . The first squadron of Mirage 2000 became operational in Indian air force on 29th June 1985 . The Indian government were negotiating with the French government for the acquisition of total 150 planes . As per this plan, the two squadrons were to be purchased in flyaway condition and the remaining would be manufactured by Hindustan Aeronautics Limited ( HAL ) under license . However , this plan was scraped due to political reasons mainly due to Russia being the largest supplier weapons to India. The Indian government instead decided to acquire Soviet Su 30 MKI air superiority fighter in substantial numbers . Later on India started locally manufacturing Su 30 MKI under license and this number is close to 250 planes assembled by the HAL . The Kargil war is the fourth armed conflict between India and Pakistan fought in the hilly regions of Kargil district of Kashmir in 1999 . The Kargil war started by Pakistan by infiltrating into the Indian Kashmir and occupying the Indian posts located along the hills of Kargil. These forward posts are vacated by the Indian army every year due to extreme cold weather conditions . Taking advantage of these vacant Indian posts , the Pakistani soldiers disguised as Kashmiri militants infiltrated into these vacant positions on the Indian side of the LOC ( Line Of Actual Control ). By the time these Pakistani act of aggression is noticed by the Indian side , Pakistani soldiers had already taken well-entrenched positions. The Indian army launched a massive counterattack to evict the Pakistani soldiers from these Indian posts . In this Kargil war , the Indian Air Force ( IAF ) extensively used French Built Mirage 2000 . During the Kargil war, Indian Air Force used Mirage 2000 for both Ground attack and reconnaissance operation. The IAF Mirage 2000 targeted the Pakistani Positions with Laser-Guided Bombs with pinpoint accuracy. These attacks by Mirage 2000 were very effective and caused heavy losses to the Pakistani army during the Kargil war. 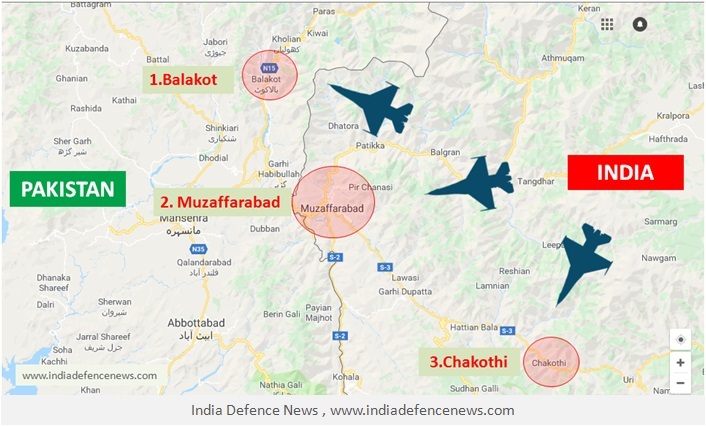 In a major crackdown on the terrorist camps in Pakistan , the Indian Air Force carried out series of raids on 26th Feb 2019 at 3.30 AM, early morning on the terrorist camps present in POK – Pakistan Occupied Kashmir in Pakistan. Total of twelve Mirage 2000 was used to carry out these attack. These attacks were conducted on three places in Pakistan which were being used by Jaish-e-Mahommad, a terrorist group operating from Pakistan who had claimed responsibility for the recent Pulwama attack, in which 40 Indian CRPF soldiers lost their lives in a suicide attack. For this operation, the Indian Air Force used, recently upgraded Mirage 2000 I , equipped with latest Israeli Rafael made Spice 2000 Popeye air-to-surface standoff missile. These missiles are especially used for long range deep strike ground attack weapon. The Indian Air Force successfully destroyed all the targeted terrorist camps in Pakistan using SPICE 2000 Missiles and all Mirage 2000 safely returned to the base. The Spice Missile are available in many variants depending upon the weight of the warhead. The Spice Missile is also being used by US Air Force. Mirage 2000 has recently been upgraded and the new weapons package might include latest Storm Shadow / SCALP Missiles designed by MBDA. These missiles are especially used for long range deep strike ground attack weapon. The Scalp Missile weight is around 1300 KG each, which is a conventionally armed with range exceeds 250 KM. The Scalp Missile is currently being used by Britain, France and Indian Air Force. After three decades of service with IAF , the Indian government finally decided to upgrade the Mirage 2000 . These upgrades were a major upgrade and the negotiations for these upgrades lasted for almost seven years with the French government . The Indian government signed an agreement for $2.1 billion with French companies Thales and Dassault Aviation in July 2011 for up-gradation of 51 Mirage 2000Hs currently being operated by the IAF . As per this contract , these OEM ( Original Equipment Manufacturer ) companies will upgrade the Indian the 51 Mirage 2000 to Mirage 2000-5 standard. The agreement also includes the supply of the latest systems and sub-systems as per the specifications specified in the agreement. Under this contract, 4 planes have already been upgraded in France and the remaining 47 planes would be upgraded by HAL as per the contract . A separate agreement for $900 million has also been signed with Hindustan Aeronautics Limited ( HAL ) in 2011 to carry out the up-gradation program for remaining 47 Mirage aircraft in India. As per the contract , the French OEM companies Thales and Dassault Aviation were contracted as a lead integrator for the upgrade program. The French company MBDA would provide the latest weapons package for this upgrade program. Installation of new mission computers . Latest identification Of Friend Or Foe system. New Two Lateral Cockpits Displays . Advanced Head Down Display systems . Latest Night Vision Goggle Glass Compatible Cockpits. New Electronic Warfare Suit . New Radar Warning receivers For Missile. Latest Weapons Developed by French MBDA .